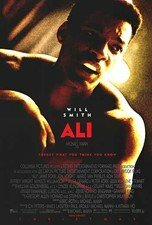 Will Smith plays Muhammad Ali in this film that covers the Champ’s rise from the Louisville streets to the Rumble in the Jungle. Ali follows the champ's early days as Cassius Clay and his rise in sports and politics, including his controversial refusal to fight in the Vietnam War. Ali was a three-time World Heavyweight Champion and won a gold medal as a light heavyweight at the 1960 Summer Olympics in Rome. Will Smith was nominated for the Academy Award as Best Actor for his role as Muhammad Ali.